and steps 6, 7 & 8 until you've completed all 5 Mysteries. Finish with the Hail Holy Queen and the Sign of the Cross. I Believe in God the Father almighty, Creator of Heaven and earth; and in Jesus Christ, His only Son, our Lord, Who was conceived by the Holy Spirit, born of the Virgin Mary, suffered under Pontius Pilate; was crucified, died, and was buried. He descended into Hell; The third day He rose again from the dead; He ascended into Heaven, and sits at the right hand of God, the Father almighty; from whence He will come again in glory to judge the living and the dead. I believe in the Holy Spirit, the holy Catholic Church, the communion of saints, the forgiveness of sins, the resurrection of the body, and life everlasting. Amen. Hail Holy Queen, mother of mercy; hail our lives, our sweetness, and our hope. To thee do we cry, poor banished children of Eve. To thee do we send up our sighs, mourning and weeping in this valley of tears. Turn, then, most gracious advocate, thine eyes of mercy toward us. And after this, our exile, show unto us the blessed fruit of thy womb, Jesus. 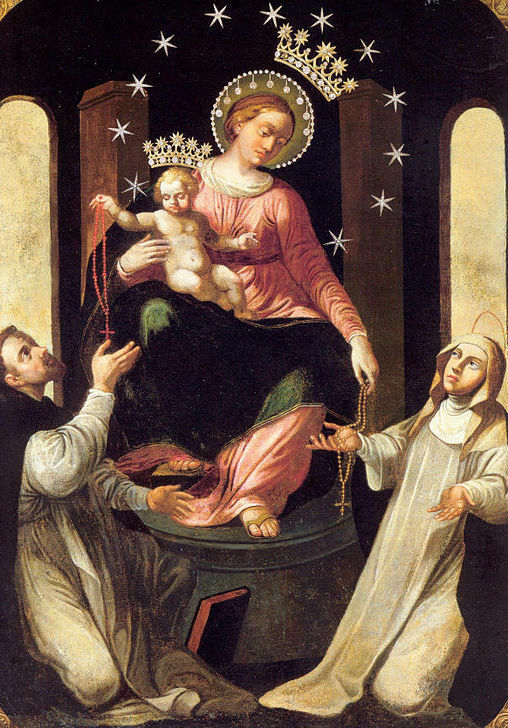 O clement, O loving, O sweet Virgin Mary. Pray for us, O holy Mother of God, that we may be made worthy of the promises of Christ. Amen. 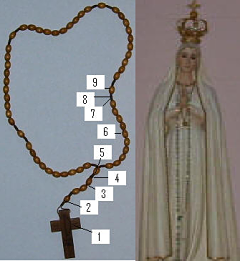 3.The Rosary shall be a powerful armor against hell, it will destroy vice, decrease sin, and defeat heresies. On the occasion of the visit of the Child Jesus to Sr. Lucia (Feb. 16, 1926), she asked: "My Jesus, what about those who forget to make the intention?" Jesus answered: "They can do so at their next confession, taking advantage of their first opportunity to go to Confession." (6) with the intention of making reparation to Me. 5. the neglect of implanting in the hearts of children a knowledge and love of this Immaculate Mother. ACT OF CONSECRATION TO THE IMMACULATE HEART OF MARY -renewed each first Saturday with the shorter formula renewed daily Any formula may be used to consecrate oneself to the Mother of God, as long as it involves a total oblation of oneself. As a suggestion, one of the following consecrations could be renewed each first Saturday with the shorter formula renewed daily. I, . . ., a faithless sinner, renew and ratify today in thy Heart, O Immaculate Mother, the vows of my Baptism; I renounce forever Satan, his pomps and works; and I give myself entirely to Jesus Christ, the Incarnate Wisdom, to carry my cross after Him all the days of my life, and to be more faithful to Him than I have ever been before. Queen of the Most Holy Rosary, in the presence of all the heavenly court, I choose thee this day for my Mother and Mistress. I deliver and consecrate to thee, and to thy Immaculate Heart, as thy child and slave of love, my body and soul, my goods, both interior and exterior, and even the value of all my good actions, past, present and future; leaving to thee the entire and full right of disposing of me, and all that belongs to me, without exception, according to thy good pleasure, for the greater glory of God, in time and in eternity.